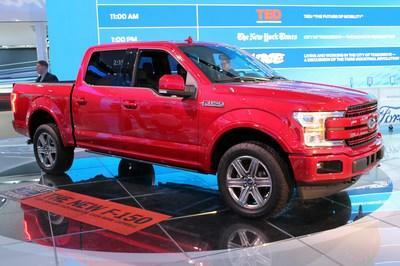 How do you make a Ford F-150 Raptor any more awesome? Hennessey Performance has a great answer – stick an extra axle under an elongated cargo bed then add 150 horsepower. Hennessey is no stranger to making outlandish vehicles with insane levels of power. 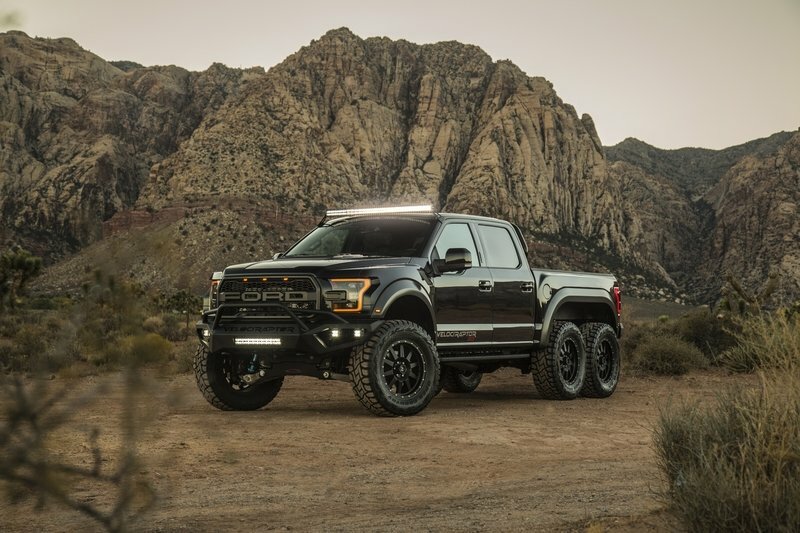 The Texas-based tuner has done several Raptor upgrades before, and naturally, their bread-n-butter is adding more horsepower to stock vehicles. But this marks the first time a 6x6 configuration has been involved. 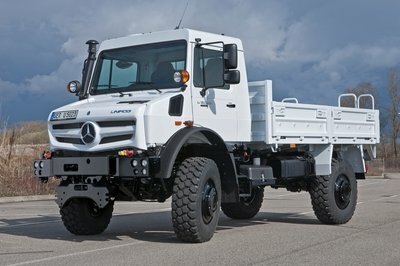 Mercedes started the 6x6 trend in 2013 with the G63 6x6. Since then, a handful of aftermarket companies have followed those tracks. The idea behind the 6x6 setup is added traction, better payload and towing capacities, and shear badassery. One look at the G63 6x6 or the Hennessey VelociRaptor 6x6 confirms that. Hennessey can’t confirm how well the VelociRaptor 6x6 handles in the dirt, however. The first example already has customer money on the hood. It’s also the same truck Hennessey took to the 2017 SEMA show. With SEMA over, Hennessey had only a few days to ship the truck to its owner in Florida. Want to know more? Keep reading for details on the VelociRaptor 6x6. It goes without saying the 6x6 portion of this build is the focal point. 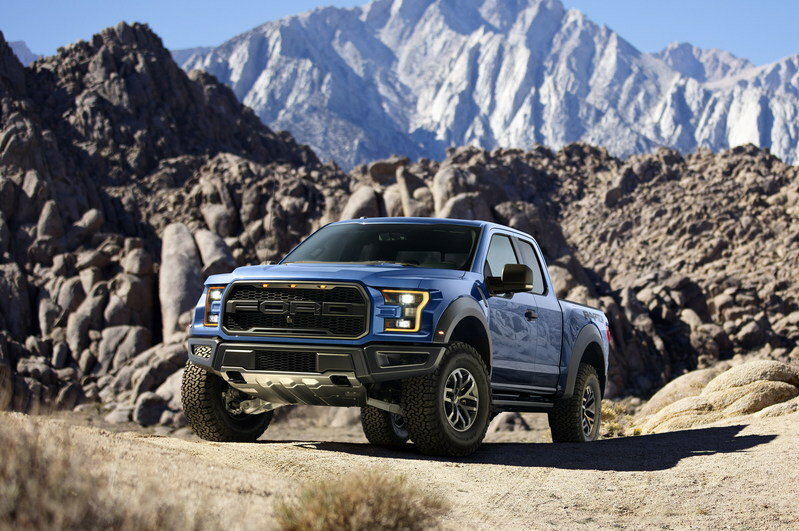 Hennessey achieved this by extending the F-150’s frame to accommodate another full axle and set of tires. The factory rear axle was moved rearward and a custom axle and pass-through differential rides ahead. 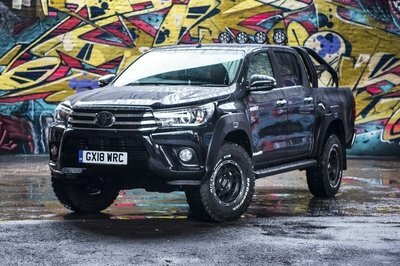 That pass-through diff allows rotational power to turn its ring gear and the driveshaft that connects to the second rear differential. It’s a similar setup to an 18-wheeler. The big-rig inspiration continues with the suspension system. A lengthened leaf spring pack spans between the axles and is mounted on a bar to the outside of the frame rails. A four-link setup locates each rear axle. Upgrade Fox Racing shocks similar to the Raptor’s stock shocks control the bounce of the one-off suspension system. To match the rear suspension, the independent front suspension was lifted for longer travel and higher ground clearance. Upgraded shocks are here too. 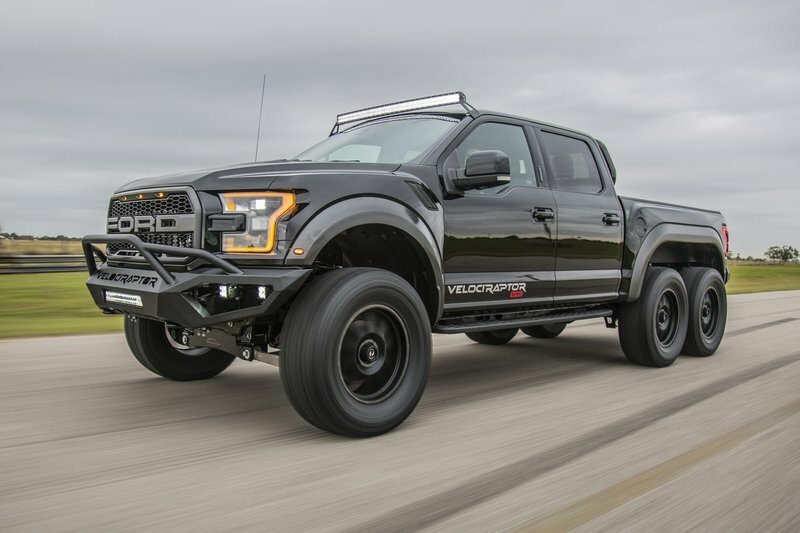 Hennessey couldn’t leave the Raptor’s high-output 3.5-liter EcoBoost V-6 alone, either. The engine normally makes 450 horsepower and 510 pound-feet of torque, which are very healthy numbers for a small-displacement V-6 with a factory warranty. 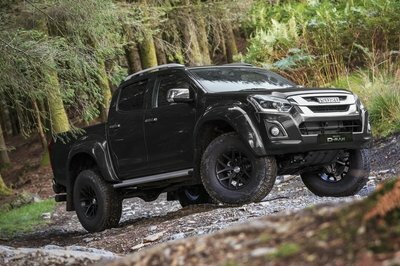 Hennessey already had its VelociRaptor 600 package developed for the Raptor, so the kit is added to the 6x6. The engine upgrade includes a high-flow intake, a modified wastegate system, an air-to-air intercooler upgrade, a cat-back exhaust system, and a recalibration of the ECU. The result is 600 horsepower at 6,000 rpm and 622 pound-feet of torque at 4,000 rpm. Hennessey says the 6x6 conversion adds roughly 700 pounds to the Raptor’s curb weight, but the extra boost makes the 6x6 quicker than the stock truck. The sprint to 60 mph is said to happen in 4.9 seconds. 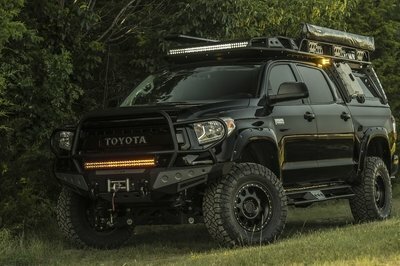 Other modifications include custom front and rear bumpers, LED off-road lights, 20-inch wheels with Toyo Open Country R/T tires, a bed-mounted roll bar, and VelociRaptor 6x6 graphics on the door, fender, and tailgate. Inside, Hennessey will customize the interior to customer tastes, but the standard upgrade includes a numbered plaque with the vehicle’s build number. Hennessey is only building 100 examples for 2018. The allotment is split 50-50, with half staying in the U.S. and half offered to customers around the world. Don’t expect to see a VelociRaptor 6x6 in the crowded streets of downtown London, but rather climbing up the sand dunes of the United Arab Emirates. Those folks in Dubai really love extravagant, over-the-top vehicles, after all. Paying for the 2018 VelociRaptor 6x6 takes Oil Sheik money, too. Pricing starts at $349,000 and goes up from there, depending on what options a customer adds. So, what do you think? 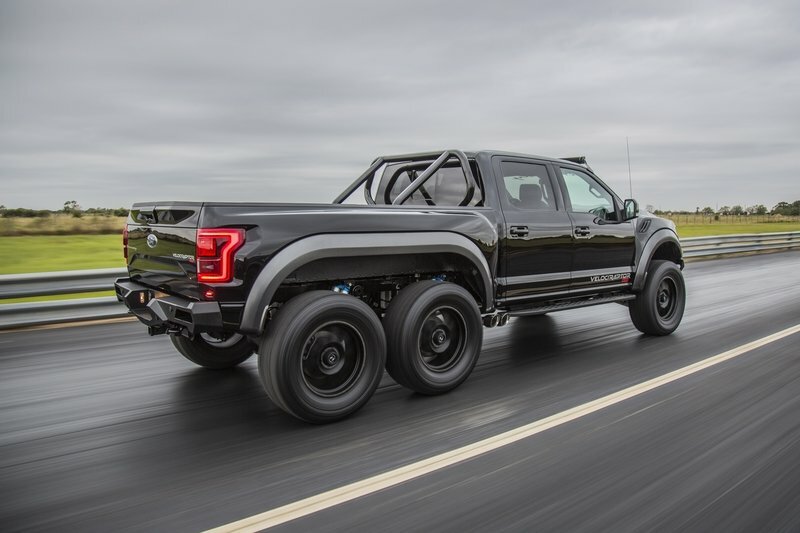 Would you drive a six-wheeled mega Raptor or is it too much vehicle for you to handle? Let us know in the comments below.